Primo dropped this new edit featuring Yumi Tsukuda and Stephan August out cruising spots in California! This has a pretty chill vibe, but both of these guys stacked a bunch of real solid clips. If you’re a fan of jibby riding, both of these guys deliver for you. Take a look! Stranger and Primo have released their full “1998 Project” video online for your viewing pleasure (if you are not in a country that will block the video from audio issues). This video is 26 minutes of pure gold from the whole squad. This video is stacked with talent and you better believe they produced. Hit play to check out the full video now! “26-minute mixtape filmed in Portland, San Francisco, Los Angeles and Mexico City. Filmed by all the homies and edited by Rich Hirsch. Audio is most likely blocked in most countries so we will be putting DVD copies up for sale next week. Get a look at the new Turbo Pedals from Primo! Is it time for a fresh set of BMX Pedals? Here’s a look at the new Primo Turbo Pedals for you to check out! These pedals feature a pedal body that covers more of the spindle so the body sits almost flush with your crank arms eliminating that gap that’s usually there, which is designed to help with pedal grinds! Get a look at the pedals in the video above, then learn more below! “When Connor Keating approached us with this idea we knew instantly that it was something that we had to try to make a reality. The Turbo pedal has a unique body shape that covers the end of the axle giving a near flush connection to the crank arm. This allows you to have much more foot placement freedom when standing on the pedal as well as more grip, an improved surface contact area for modern day crank arm grinds and an all-around more aesthetically pleasing appearance. The pedal can be tightened via an Allen bolt on the backside of the spindle and also allows for the use of a thin park tool style pedal wrench. The Turbo Pedals are available now for $19.99 in Black and Tiffany Blue through BMX shops and mail-orders that carry Primo worldwide now. You can check out more photos and details on the Primo website! What do you think of the Turbo Pedals? Do you think that smaller gap between the body and the crank arm will make a difference? Who plans on trying them out? Let us know what you’re thinking in the comments below! Not quite what you’re looking for? Check out more BMX Pedals! 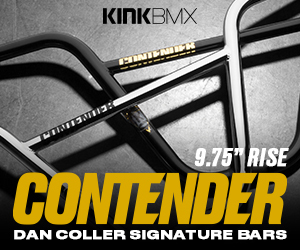 Check out more BMX products, videos and news in the Daily Section! Here’s a short but sweet edit Rich Hirsch whipped up featuring Connor Keating putting a sample of his new signature Primo pedal to good use. Hit play to check out what Connor and crew threw down on a few rail and ledge spots. “This is the pedal preview portion at the end of yesterday’s video for people wanting to watch just the riding. Primo have recruited Johanes Winkelmann to their team over in Germany through Allride Distribution! Here’s his official welcome video that’s packed full of some heavy clips from the streets. Plenty of rail destruction, big drops and more. Check it! “Straight fire! In his Welcome-Edit for Primo / AllRide BMX, Johannes Winkelmann places the streets of Jena In Debris and Ashes. And what makes the whole thing even more impressive is that Johannes needed only two days. Savage! We haven’t been big fans of all the Vlogs, but we’ve been into Rich Hirsch‘s latest videos that he has been putting up on the Stranger channel. The reason for that is because he’s been sharing videos from where Stranger and Primo parts are being manufactured over in Taiwan. Today he dropped a video giving us a look at some of the new products they are currently testing like their new V2 freecoaster and front hub, Crux XL rim, new Stevie Churchill headset caps and tire color, some new bars, a fork and more. Plus, Rich strapped the camera on for some riding to test out a few of the new products before taking a spill. Take a look! “You win some you lose some… Today I took out my new camera and tried to shoot some ride test shots while testing out some new pegs, and wheels but the spot gods had other plans and I ended up headbutting the sidwalk. Curious what Mikey Tyra is running for a setup? Mikey recently dialed in a new 2017 Dak Frame decked out with Cult and Primo parts from top to bottom. Hit play to watch the build and let Mikey give you a run through, followed up with some riding clips at TRP Skatepark in Detroit. Dialed bike, dialed riding… Can’t go wrong with this one. “A lot of you have been asking for this bike check, so here it is!! !